A student attends a course on religion at a middle school in Metz, in eastern France, on June 5. French schools teach basics, like the history of religion, but discourage any displays of religious identity. Lazare Jefroykin, an 18-year-old Jew (left), and Radia Bakkouch, a 23-year-old Muslim, work with Coexister in France. The group goes into the country's secular schools and addresses issues like religious stereotypes. Since an Islamist terror attack in January, the group has been receiving far more requests to speak. Members of Coexister, (from left) Sabah Zouaghi, Ismael Medjoub, Samuel Grzybowski and Josselin Rieth, appear on June 2, 2014, in Le Mans, in western France. Members of the group took part in a 10-month "interfaith tour" to 40 countries to meet religious communities. 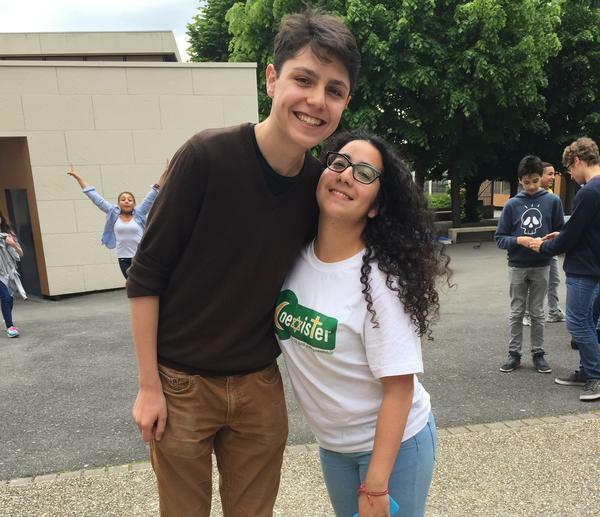 For the past several years, the group Coexister has been going into secular French schools to break down religious stereotypes in the classroom. Since January's attacks on satirical magazine Charlie Hebdo and a kosher supermarket, the demand for their interventions has skyrocketed. "We used to get two requests a week, but now it's two a day," says Radia Bakkouch, a 23-year-old graduate student who has been leading these interventions for several years. On this day, Bakkouch is meeting her colleague, Lazare Jefroykin, 18, at Paris' Gare de Lyon station. The two are headed out to a middle school in the Paris suburbs. Jefroykin, who is Jewish, says he grew up in a melting pot neighborhood in Paris, where people lived together easily. January's attacks made him feel like he had to do something, so he joined Coexister. Following the attacks, some young Muslim students refused to observe a minute of silence mourning the victims. They said the journalist had insulted Islam and were not necessarily innocent victims. 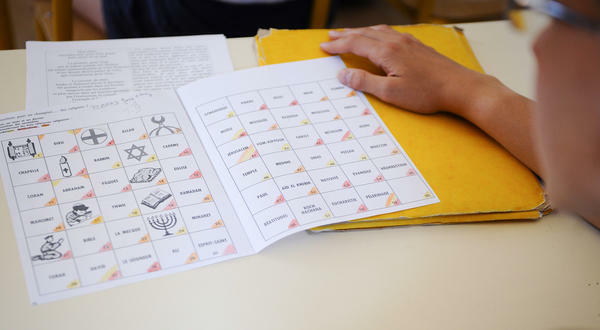 That shocked many French people and prompted the Education Ministry to double up on its efforts to reinforce France's strict secularism, known as laïcité, in the classroom. Already, outward religious symbols like headscarves, kippas and large crosses are banned in schools. When the start of the new French school year rolls around this September, students and parents will be required to sign a charter saying they will respect the values of laïcité. New teaching candidates will also be tested on their understanding on the concept of secularism. Bakkouch, a French Muslim who has spent time in Israel, says she's proud of French laïcité, and calls it the framework that allows all religions to practice freely in France. But she's worried secularism is becoming too militant, making the discussion of religion a taboo subject in the public sphere in France. "Talking too much about religion and above all defending our identity in terms of religion is not welcome in public, secular schools," he says. "You're not supposed to express any kind of religious identity because you are above all French." The two believe the absence of religious discussion creates room for misconceptions and prejudice. Their goal is to break down religious stereotypes and make students feel more comfortable when it comes to having a religious identity. In a school auditorium in the Paris suburb of Maisons-Alfort, they're confronted with 60 curious and boisterous middle-school kids. Bakkouch turns on a projector displaying the symbols of the major religions in France — the Star of David, a cross and crescent, as well as a sign for atheism. The students are asked to anonymously write down two words that come to mind for each faith. Bakkouch then collects their responses, flashes them up on the projector and begins to break down the stereotypes, one after another. She calls one particularly insidious: that Jews are rich. "You might not think it's much of an insult to be called rich," says Bakkouch. "But Jews have been murdered in France because of this stereotype." Bakkouch gives the example of a Jewish man kidnapped and tortured by a gang in 2006. And a couple recently attacked and robbed in their home in the working class Paris suburb of Sarcelles. In both cases the assailants thought their victims had money because they were Jewish. Bakkouch says the fact that she's Muslim and Jefroykin is Jewish impresses students. "It has an impact," she says. At the end of the workshop, the 13-year-olds are enthusiastic about their experience. "All religions are important, you have to respect them, and understand them," says Gad Ramau. Another student, Jean-Louis Charles, says he noticed all the prejudices. "Especially against Islam," he says. "Because people say Muslims are terrorists." Religious figures like priests or rabbis are not allowed into French public schools. And displaying one's religious identity is discouraged. But Bekkouch and Jefroykin tell the young people to take pride in the religious diversity in their classrooms and learn from each others faiths. We're going to explore a shift that began in French schools after last January's terrorist attacks on a satirical magazine and kosher supermarket. When there was a national minute of silence in France to remember the victims, some Muslim students refused to take part. That led to a renewed emphasis on values like freedom of speech and secularism in French classrooms. NPR's Eleanor Beardsley reports some feel that emphasis is stifling any discussion of religion in schools. ELEANOR BEARDSLEY, BYLINE: Radia Bakkouch and Lazare Jefroykin meet up at the Gare de Lyon train station to travel to a middle school in the Paris suburbs. The young Muslim and Jew are part of an interfaith group called Coexister. Bakkouch says the group was set up six years ago to encourage religious dialogue and break down stereotypes. RADIA BAKKOUCH: Just the fact that we are two young people talking and we are from different religions and especially Jewish and Muslims, like, it's really the - wow, it has impacts when we go in schools and stuff. BEARDSLEY: Twenty-three-year-old Bakkouch is a French Muslim who's also spent time in Israel. She says she's not against French laicite, or secularism. In fact, she's proud of it. BAKKOUCH: It is supposed to the framework that allows every religions to promote their beliefs and every person can practice their religions at home and they're protected. BEARDSLEY: But Bakkouch says sheâs worried the discussion of religion is becoming a taboo subject in the public sphere in France. Her Jewish colleague, 18-year-old Lazare Jefroykin, agrees. LAZARE JEFROYKIN: Talking too much about religion and above all defending our identity in terms of religion is not too much welcome in secular school because you mustn't express any kind of religion identity because you are French and above all French. BEARDSLEY: As they arrive at the school, Jefroykin says it's his first time out with Coexister and he's nervous. But he grew up with Muslim friends in a multicultural Paris neighborhood and he doesn't want January's terrorist attacks on journalists and Jews to destroy that. BEARDSLEY: On an overhead projector, the pair bring up symbols for the major religions of France and ask the middle schoolers to write down two words that come to mind for each faith. BEARDSLEY: As the responses come in, Bakkouch begins to address one stereotype after another. She calls one particularly dangerous, that Jews are rich. BEARDSLEY: "Perhaps you don't think it's a big deal," she tells the students, "but Jews have been murdered in France because of this stereotype." BEARDSLEY: The sixth-graders clearly warm to the game, peppering their young instructors with questions. Religious figures like priests or rabbis are not allowed into French public schools and displaying one's religious identity is discouraged, but Bakkouch and Jefroykin tell the young people to take advantage of the diversity of their classmates to learn about each other's faiths. BEARDSLEY: Afterwards, the 13-year-olds are enthusiastic about their experience. BEARDSLEY: "All religions are important and have to be respected," says one girl. "You can't really call any of them worthless." There's a lot of prejudice, especially against Islam, says one boy, 'cause everybody thinks Muslims are terrorists. Coexister is in high demand these days as schools seek to build tolerance and understanding by actually talking about religious beliefs in the classroom. 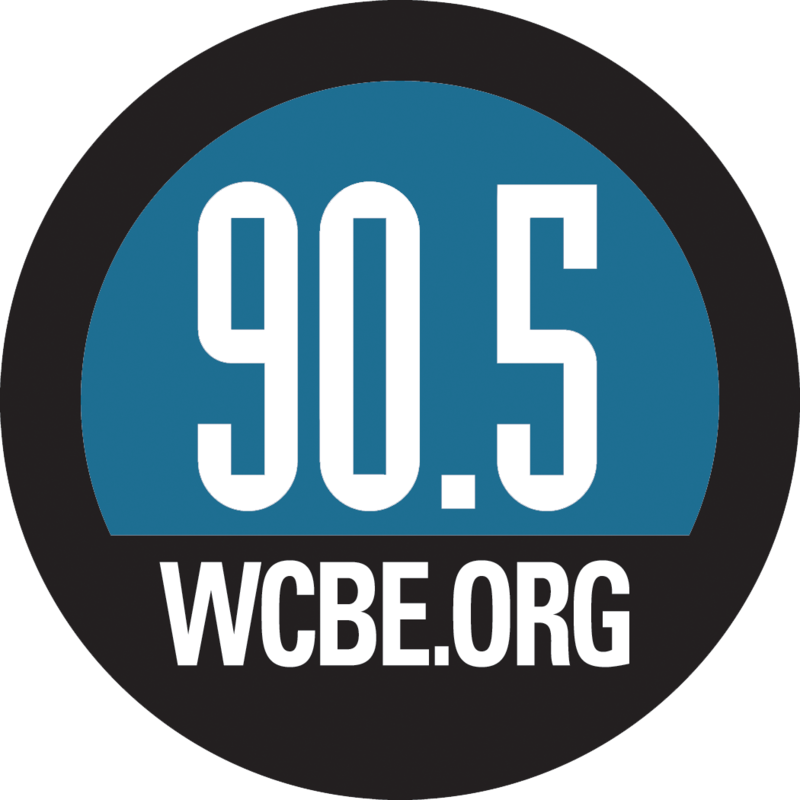 Eleanor Beardsley, NPR News, Paris. Transcript provided by NPR, Copyright NPR.